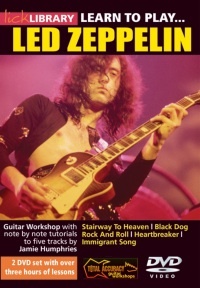 Learn To Play Led Zeppelin Vol. 1 sees Jamie Humphries breadk down, note by note, five all time classic tracks from Zep. Featured are Black Dog, Rock & Roll, Stairway to Heaven, Immigrant Song and Heartbreaker. 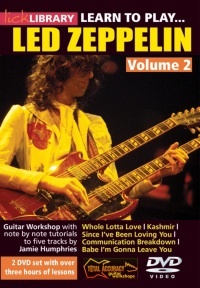 Learn To Play Led Zeppelin Vol. 2, and Humphries opens up another five Led Zeppelin Tracks for your learning pleasure. This time he looks at Whole Lotta Love, Kashmir, Communication Breakdown, Since I’ve Been Loving You and Babe, I’m Gonna Leave You. Each of these double DVD sets contains over three hours of lessons and RRP is UK £24.99. 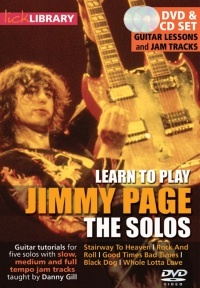 Next up, is Learn To Play Jimmy Page: The Solos. This one is presented by Danny Gill and concentrates at learning five of Jimmy’s classic solos. You learn them one lick at a time and you can practice along with the jam tracks on the included CD. Each track is featured at slow, medium and full tempo so you can build up your speed as you learn. The solos included are Stairway To Heaven, Rock And Roll, Good Times Bad Times, Black Dog and Whole Lotta Love. 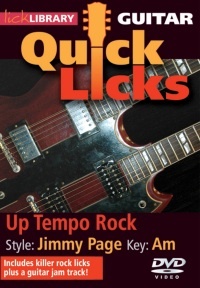 Lastly, Lick Library bring us Quick Licks – Up-Tempo Rock in the style of Jimmy Page and Quick Licks – Minor Blues in the style of Jimmy Page. In these DVDs, Danny Gill looks at a number of Jimmy’s solos and examines over 70 licks (across both DVDs) to give us an appreciation of Jimmy’s style. The DVDs examine scales, string bending, hybrid picking and plenty of Jimmy’s blues-style licks. Each has backing tracks to jam along with. Each of these DVDs sells for UK £19.99. Head to Lick Library for more information.